History: Pam, a breeder favorite, raced almost two years and retired from racing as a AA racer in May 2013 to become a brood matron. 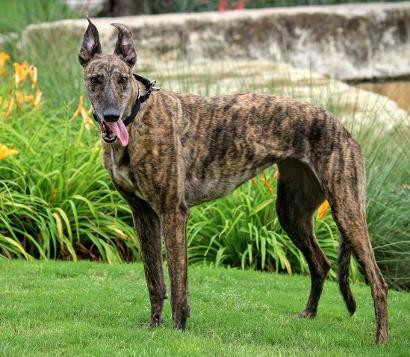 Pam, part of the Flying Penske line, had two litters of pups (only one registered on Greyhound Data) with Lonesome Cry as the sire. She produced a number of racers. Pam is now ready to retire as a mom and become a couch princess. 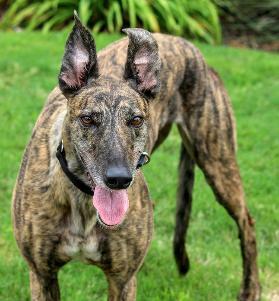 We’ll get to know this brindle cutie and update her bio after she settles into her foster home. Pam chillin' in her forever home. February 25, 2017 update: Pam has found her forever home with her current foster family. 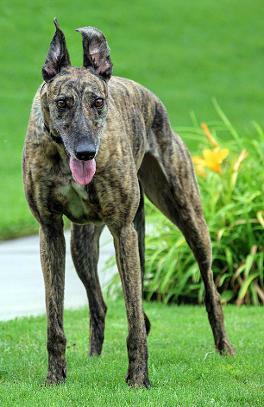 She will be living with Greyhounds Taggart, Willow Song, and Rowdy. 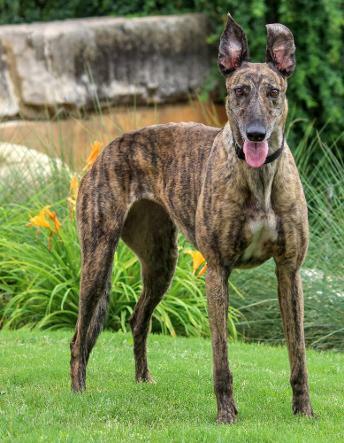 May 30, 2016 update: Pam is a seasoned foster and has learned the household routine and her place with the other Greyhounds in the house. 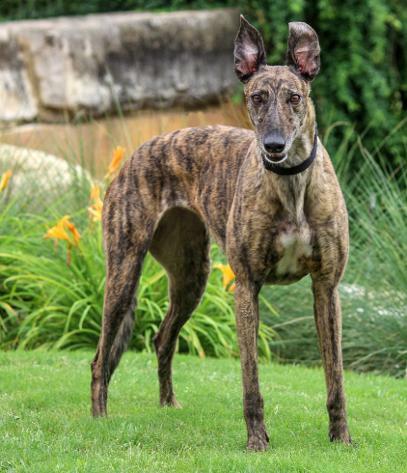 Pam is adaptable – she was in one foster home for a while, then kept as a temporary foster by another Greyhound owner periodically and now resides in a foster home with four other Greyhounds. You would hardly know Pam was there if she weren’t so cute. She is very much a petite, quiet lady – unless you are not totally able to read her mind and she feels like she must give you some instruction – then she gives you spoken instructions – in a most gentile voice, of course. She does not care to go outside often. When other dogs (with an older one in the home) go out during the night, Pam does not even raise her head. She sleeps through it all. She only goes out when absolutely necessary. She has adorable eyes and the sweetest expression. 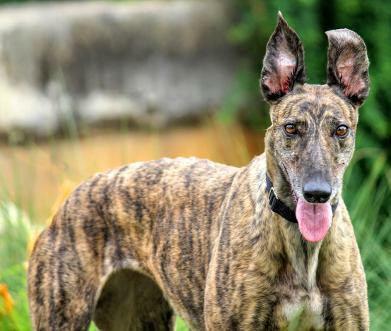 And those ears – how can you resist those ears. She will come to you for petting and otherwise lays on her “tuffet” and waits for you to come to her. Pam loves to go for car rides and is thrilled to go anywhere you want to take her. She crates (although admittedly she does not care much for it – somehow it seems beneath her) and she rests quietly until you come home. She does greet you excitedly when you come in. Pam is a joy to have as a foster and will be a joy in her forever home. April 24, 2016 update: Pam was excited to be adopted but unfortunately things did not work out as well as she hoped. 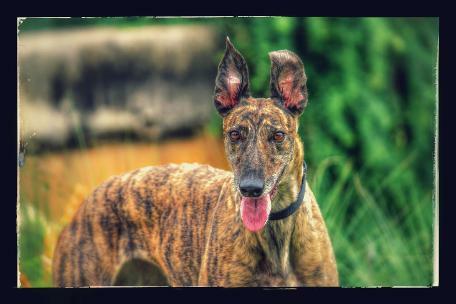 Pam is back in her TAGS family resuming her search for a forever home. April 5, 2016 update: Pam was adopted today. Congrats to Pam and her new family! November 1, 2015 update: Pam came to TAGS for a life of retirement and to find her loving lifetime home.